Wow a craft I've never tried, I've done some embroidery but I get bored after a while cause it can be so daunting...although it does seem to go faster than cross stitch! Oh the ideas! That kit you bought looks lovely and I also really like the funky designs on Wool & Hoop. Such fun! While I have purchased the Stitch-It kit, I am almost afraid to delve into other crafts because what if I like it as much as knitting?? I simply don't have the space. The New Crewel looks mighty interesting. Curses. I asked for that book for Xmas! I also did many a crewel projects when I was little, in fact, I still have some of the things my mom made me in the 70's. Glad to hear you liked the book. Can't wait to see it! 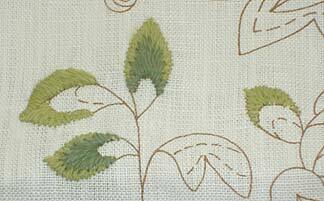 If you are looking for new crafts and like traditional embroidery, you might like Hardanger Embroidery. You seem to like Scandinavian tradition, so I thought perhaps it would interest you. I don't have any particular links but got many hits when I googled it, and a good technical description at Wikipedia. I'll have to check that one out. I enjoy embroidery, and counted cross-stitch can be fun, but I enjoy doing things OTHER than X's once in a while! Whether floss or yarn, I don't care, but I love doing the different stitches. My favorite project to date? When I took my favorite Carl Larsson painting and recreated it in embroidery. I bought a selection of different yarns and flosses, and spent the next however-many months with my embroidery and my stitch encyclopedia, asking myself questions like, "What would be the best stitch for the girl's skirt?" Fun! This is a beautiful traditional design! When I need a break from papermaking, I'm going to keep this in mind. I've not tried any needlework other than knitting really. I learned a bit of crochet a few years ago, but never did anything else with it, but this crewel work has been an idea niggling in the back of my head for a couple of years now. I read Monica Ferris' series featuring an owner of an embroidery-needlework shop with all sorts of crewel work, Hardanger, etc., even a bit a knitting that have always made want to learn more about these and possibly attempt something in the future.